The Aimpoint Pro has been designed by some of the most experienced professionals, giving this rifle optic innovative features that improve performance in challenging conditions. This Pro is perfect for individuals in modern law enforcement, as well as other rifle users that wants for rugged housing, enhanced accuracy, increased battery life, affordability, and ease of use. The Aimpoint Pro is always on, and it utilizes one of the most impressive batteries ever seen. The high efficiency circuit contained within this awesome rifle optic can power the sight for 3 years, without the need to change the battery. This always-on design also ensures that you do not have to waste time fumbling with the switches when you are outdoors. The battery also comes with a strap so that you do not lose it. Rifle owners buy optics for one main reason; improved accuracy. After all, no one likes missing their target. That is why the Aimpoint Pro has been equipped with a 2 MOA red dot, which works to maximize accuracy in all environmental conditions and at all distances. 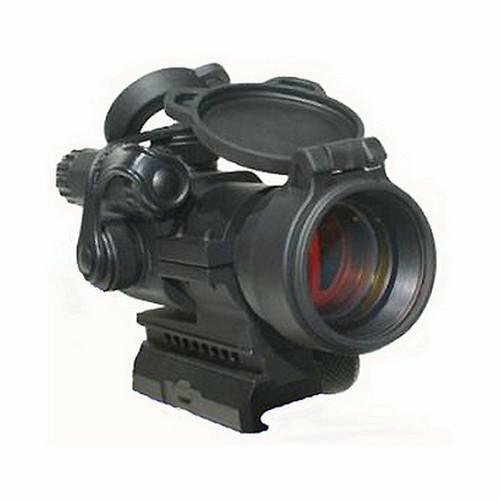 The Aimpoint Pro has a band-pass coating on its front lens, which allows it to be used in conjunction with every generation of night vision gadgets. 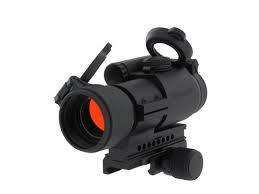 Additionally, the Aimpoint Pro is compatible with 3x magnifiers (Aimpoint), as well as Concealed Engagement Units. AR15s, and M4 Carbine weapons. This removable spacer can be taken off if you want to use the sight on sub-machine guns and police shotguns. Mounting is simple using the twist knob found on the rail grabber mount of the QRP2, which provides optimal levels of pressure without causing over-tightening. 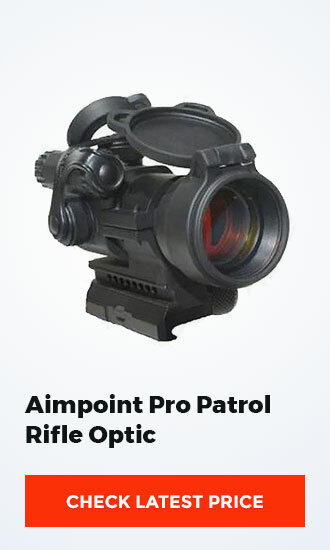 When it comes to the lenses of the Aimpoint Pro, both lenses are recessed (front and rear) within the body of the sight in order to protect against fingerprints, scratches, and impact damage. Furthermore, the front lens and rear lens are protected by flip covers that keep them clean. As if that is not amazing enough the Pro boasts of a front lens opening that is threaded, which allows you to use an Anti-Reflection Device (ARD) for improved performance. Last but not least, the rear lens has a transparent cover which allows you to engage with your target in emergency situations, even when the lens cover is closed. There is no point in purchasing a rifle optic if it is going to break down easily on impact. 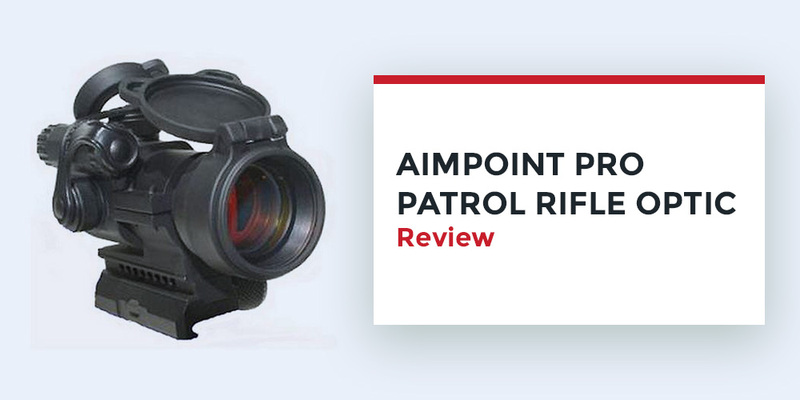 Aimpoint knows this, and that is why the Pro Patrol is made with an anodized aluminum alloy housing.This rugged housing has been made for use outdoors, and can stand up to impact and contact with the elements. In fact, this rifle optic is waterproof up to 150 feet, so you should not worry about using it in wet conditions.! Q: Do I need to purchase a mount separately? A: No, a mount is included in the package. Q: Is the rifle optic unit rated for water resistance? A: Yes, the Aimpoint Pro is waterproof up to 150 feet (45m), and has a temperature operating range of between -50 degrees and 160 degrees. Q: Does the Aimpoint Pro have an on/off switch? A: You can turn on and adjust the brightness using a rotary switch, however, the Pro runs using an inbuilt circuitry that allows you to leave the sight on for 3 years on a single battery. The Aimpoint Pro has established itself as an excellent sight for real-world situations. This rugged, durable, reliable and accurate optic is high-performing and will make your time outdoors much more enjoyable. So if you are looking to make a worthwhile investment, then this is the direction to go.